Anyway, I'm nursing the arm as much as possible. Maybe by the trip back I'll be able to knock out some of the smaller samples. And just because I can't knit doesn't mean I can't peruse the local yarn stores of Boston, right? In the meantime, I discovered the most fun thing you can do in your basement EVER. It's dyeing your clothes!!! Beauteous dark brown clothes! Brown is my favorite color this year, and now these clothes have new life! The idea for this (which never would have occurred to me, all the yarn-dyeing I do notwithstanding) came from Annie, the manager of the store. She loves dyeing her clothes. And boy o boy, I can see why!! It's like I got a whole new wardrobe! I can't believe how well the dye took and how easy it was. Now I want to paw through my clothes, feverishly looking for something else to dye!! 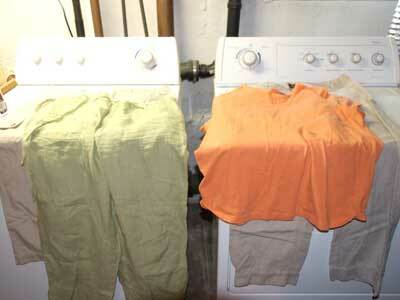 Matthew has already issued an edict that if I dye any of his clothes, he will divorce me. I wasn't planning to, it will take a long time to go through all of my clothes and dye all of them a different color. 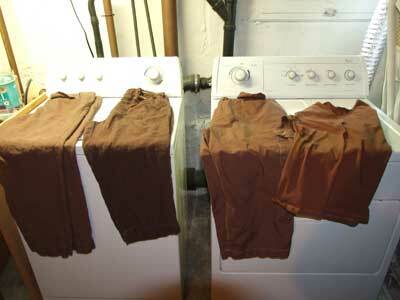 Hmm, an all brown wardrobe? POOOOO! you wont see my 874 yds of laceweight i pun up all by myself. by. myself. well i had help from mr. french press & mrs. coffee grinder. and mrs. tootsie roll. you can see the pics on my blog though. it's in the DONE 2007 section (peaches, no herb).